When my grandma was hospitalized a few months ago, I found myself shuttling back and forth from the hospital almost every day. While at the hospital, and to avoid having so many people in one ward, I’d sometimes linger in the corridors reading the various signs around the hospital. 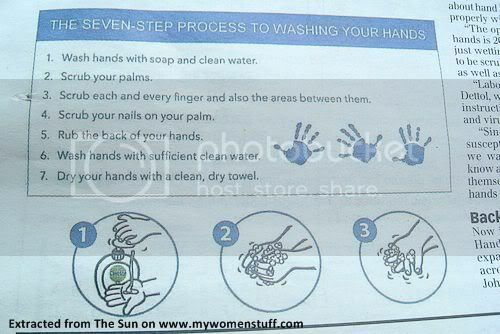 One that caught my eye and which I’ve put into practice ever since was a diagram showing the proper way to wash your hands. The proper way to wash your hands takes a little time but the effort is worthwhile. Run clean tap water over your palms and use hand soap. Rub your hands vigorously for at least 15 seconds. Scrub your hands, fingers, palms and nails. Do not forget the back of your hands. Rinse with clean water until all soap is washed off. Dry hands with a clean dry towel or disposable towel. Hands pick up a lot of dirt and bacteria. Just think of the many things you touch throughout the day. Then, your eye itches or you scratch your face or nose and those germs are transferred to you. This is the easiest way for influenza and the common cold to spread because the virus can remain inert on surfaces for a long time waiting to be picked up by the unwary. Do not develop an obsessive compulsive disorder or pathological fear of germs. The idea is to ensure that you wash your hands at the very least after using the toilet and before eating. You might be surprised at the number of people who do not do this! I have personally seen it myself at public toilets and I am appalled. Here is a list of situations when you should wash your hands as compiled from the Mayo Clinic. With the current spread of the Influenza A (H1N1) and previously the “bird flu” or SARS it pays to wash your hands regularly especially if you have been out and about and do not know who you come into contact with. Agree with you. I always keep a bottle of waterless hand sanitizers with me – it’s really helpful. I am a firm advocate of proper handwashing! Most importantly, after using the toilet! I work at a diners, and all of our staff are used to washing our hands after using the toilet and sanitizing our hands every 20 minutes [using the alcoholic table sanitizing spray]. However, the customers do not have the habit!! i caught one of them leaving the toilet without washing her hands. So disgusting! I thnk effective hand washing is very important! especially during the times like these where H1N1 is the main topic. If you cannot wash your hands with water it’s good that you carry any of the alcohol based hand sanitizers nowadays which contains “moisturizer” and it is quite “skinfriendly”. That’s what they use in the hospitals also.